As children, it is our responsibility to look and take good care of our parents when they are growing old when they do not have an income of their own. Many of us feel the burden especially when our income is not enough to provide for our own family and for the needs of our elderly parents. This is why the former president and now House Deputy Speaker Gloria Macapagal-Arroyo is pushing for tax exemption to those taxpayers who are taking good care of their elderly parents. House Bill 1522 that seeks to amend Section 35 of Republic Act 8424, or the National Internal Revenue Code of 1997, to include an additional exemption of P25,000 for each elderly parent being cared for by a taxpayer. “An additional exemption of P25,000 for each elderly parent shall likewise be allowed to the individual taxpayer: provided, that the elderly parent is chiefly dependent on and living with the taxpayer,” she said. “Thus, it is not surprising to see family members who provide their aging parents a wide array of assistance from medications, adult healthcare and in some cases, medical procedures,” Arroyo noted. 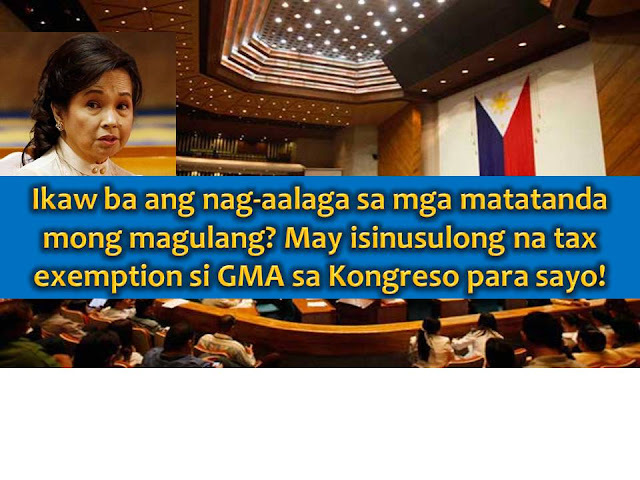 Under Arroyo's proposal, an elderly is defined as any parent who is at least 60 years old with no means of support. Granting additional exemption for those taking care of their elderly parents is geared towards relieving them from tax burden and at the same time allowing them to save money which can be used to meet the nutrition, education, medicines and other basic needs of other dependents.